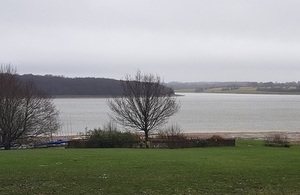 The Environment Agency has issued a temporary winter drought permit to Southern Water Services Limited, to help refill Bewl Water reservoir in East Sussex. The water company made an application on 5 January stating it needed to take more water from the River Medway to help refill Bewl Water, which was only 42% full at the start of the year. Despite a wet December, the autumn was very dry. There was also lower-than-average rainfall across south east England during the previous winter. This prolonged dry period across the region has left many groundwater supplies and some reservoirs lower than normal for the time of year. Bewl Water is the largest reservoir in the south east of England and can hold 31,000 million litres of water. It is an important source for Southern Water, which manages the supply of water to over 2.5 million customers across south and south east England. Southern Water already routinely takes water from the River Medway to fill the reservoir. The change to the permit will allow the company to abstract additional water until the end of March. The change will mean Southern Water can take water when river levels are lower than the previous limit. The water company has requested the change as part of its plan to secure public water supplies for the upcoming summer. In determining the drought permit application, the Environment Agency has taken into account the very low rainfall, the impact this has had on water supplies, as well as considering the response to the recent public consultation. Although it has been wet over the past few weeks, overall this winter across south east England there has been lower-than-average amounts of rain. Consequently, we now need above average rainfall for the remainder of the winter to replenish our water resources. The Environment Agency has to balance the water needs of people, businesses and wildlife so we have carefully considered Southern Water’s application. We have decided to grant this temporary change to the existing licence, helping the company to refill the reservoir at a time of year when there will be less impact on the environment. We will carefully monitor any effects and take action if needed to ensure the environment is protected. We encourage people to follow advice from their water company about saving water. Using water efficiently will help ensure we have enough water for people, businesses and the environment. All media enquiries: 0800 141 2743. Or email southeastpressoffice1@environment-agency.gov.uk.